So, I have been trying to get a little craftier, ya know do more, make more kinda stuff. I wanted to try something new, and as i was cleaning out presleys closet I found all these recieving blankets that i never used, as i threw them in the good will pile thinking " what a shame, they're so cute" I had a great idea! I cut them up and made a quilt! yeah for me, right. It was a little tougher than I had anticipated, just not quite as easy going as that nice thought, but i managed to get it done and it's not half bad. there are some imperfections, but it's usable and that's all that matters, right? just don't look too close. I have also had so much fun doing the birpclothes, and I FINALLY found some cute boy material at walmart, so I got some done. Now they're all packaged up waiting for a sweet little baby boy to spit up on them,( anneka). these are so soft too, using that warm and natural batting really makes a difference, I was pleased with them and my new blanket, now I just need some other great ideas! Happy crafting! 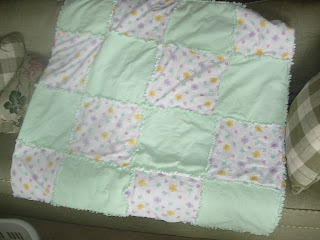 I'm thinking of attacking another pieced blanket, wish me luck! Way cute boy material, you are right, Wal-Mart never has cute boy material! Argh!!! You are so crafty! Way to go. Maybe one of these days I will become more crafty. I've gotten so used to just buying everything because it is less of a hassle. The blanket is adorable! I should try that with some of our blankets! Wow your crafty and thrifty... that has to count for something! The blanket looks super cute. And the burp clothes.. let's just say they turned out way cuter than mine!!! The fabric is adorable! My baby will be spitting in style! Well arn't you crafty! 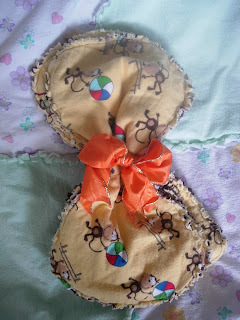 WAY WAY cute and what a great idea for old blankies!! !